I’ve spent most of today doing research for a longer piece I’m going to write when it hit me I didn’t write anything yesterday. I’m hoping to stop the alternate day posts and get back to posting every day…so here we go! * Tony LaRussa announced today that he’s retiring. I have absolutely nothing good to say about Tony LaRussa so I’ll just say goodbye. * Derek Lowe has reportedly been traded to the Cleveland Indians. He was never one of the “25” that I expected to last this long. What do I know? The sad part of the trade is that the Braves are getting a single A player and $5 million toward the $15 million left on his contract. Ouch. 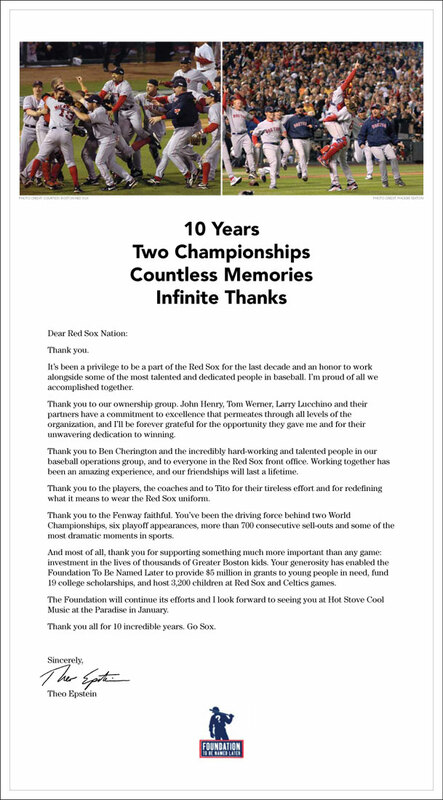 Happy Anniversary, Red Sox Fans! Like many of you, I am no fan of Joe Buck. I don’t like his broadcast style, I don’t like his personality and I don’t like his snarky derisiveness when it comes to baseball and especially the Red Sox. But seven years ago tonight, I heard Joe Buck say the most amazing words I have ever heard a broadcaster say and because of that every time I hear Buck’s voice during a World Series game, just for a few moments, I love him. I was reminded of this tonight when I turned on Game 6 of the World Series. When I hear him say something baseball-related over a visual of the World Series, I’m suddenly in my den on October 27, 2004 watching Edgar Renteria hit the ball “Back to Foulke”.